Private sunny villa with heated pool and river access. Spacious detached villa built on the site of an historic mill in a tranquil location right by the river Tech yet close to the region's many attractions. With cream tiled floors, open beams and freshly decorated throughout, the villa offers spacious accommodation for up to 10 people. It has a private entrance and driveway. The house is comfortable and spacious and very well laid out. As you open the gates on to the pool area you immediately feel like you are on holiday. There are 5 very spacious bedrooms, all designed to a very high specification. The en-suite shower rooms have large head power showers. The bath sheets are fluffy. The beds are extremely comfortable with lovely crisply ironed white linen. We provide plump feather pillows. Every effort has been made to make the rooms feel welcoming and relaxing. In this region a lot of life is lived outside. There is somewhere to sit all day long to make the most of the sun or to find shade. Breakfast can be taken on the large balcony overlooking the river. Lunch is perfect in the shaded pergola in the garden. Around the pools there are wooden recliners so you can soak up the sun. The large ceramic tiled pool is a particular highlight. The beautiful charming town of Ceret with its artistic heritage and spectacular Saturday market is just 5 minutes away. There are cafes on every corner, restaurants in every square; and frequent music and dancing in the streets. There are plenty of local walks at different levels of effort. They offer wonderful views across the valley to the Mediterranean or up to the Canigou and Pyrenees beyond. The villa is 10 minutes from the Spanish border, 30 minutes from the Mediterranean(Collioure, Argeles, Banyuls etc.) and 90 minutes from Barcelona. Skiing in winter is 90 minutes away. The region offers endless cultural and recreational facilities and the sun shines nearly every day of the year. Fly to Perpignan (35 minutes away), Girona(50) or Barcelona(90). Stephen and Sarah Hill own the property. They have lovingly restored it over the last 10 years and created a home they feel very proud to own. They like their home to feel comfortable and a pleasure to stay in and this is very much what you will experience when you stay at Mill House In the UK they live in Marlow Bucks. Stephen is a consultant to small business owners, and Sarah has her own training company. They have 3 grown up children. They love to be at the house together as a family, and their children are always keen to book a week at Mill House with their friends. Mill House is a home where you immediately feel on holiday. Everything about the house has been created with this in mind. The house and gardens are very well maintained and the house, spotlessly clean. The house backs on to a fast-flowing river which sounds wonderful from the house and gardens. It is sufficiently far from the house to be safe for young children. The house is looked after by a local french family who are friends of the owners. They treat the house as their own when Sarah and Stephen are not there. They take care of their guests and take much pride in ensuring that you have everything you need when you arrive and throughout your stay. All the rooms have luxury ensuite facilities. Three of the rooms have en suite Italian shower rooms, with very high specifications. The master bedroom has a double sink, large shower, and beautifull mountain views. Large Fluffy Bathtowes are provided. Shower Gel and soaps are included. There is ample space for parking up to 4 cars. Bath size white fluffy towels in every bathroom, plus face towels. High beamed ceiling, two sofas, and additional seating. Books and games available. French window onto the balcony overlooking the river. Range Oven, with 5 gas hobs. Modern bright and well equipped kitchen, good supply of cooking utensils. Fully able to cater for a large number of people. Lovely oak dining table that will easily seat 10 adults. Books are updated regularly, and guests are invited to read or leave their books as they choose. There are numerous games available in the house for guests to use. The house is surrounded by the garden it is a real feature of the property. The garden is very well maintained. There are shaded areas for dining. Plenty of sun beds for relaxing around the pool. The balcony overlooks the river, it gets the early morning sun, and again the evening sunset. The perfect place to start and end your day. The back of the house leads you through private gardens to the river. There is a small beach area, and swimming is possible. Firstly, this is a truly lovely location and our extended family of 10, aged 12 to 83 had a wonderful week here. We'd happily return. Most special is the access to a secluded river beach with one of the most perfect swimming holes we've come across and often only ourselves there. Going down at night and swimming under the stars was magical. In mid August the fig tree below the back balcony was in fruit - delicious! Varied and flexible outdoor seating all around the house was great, though there are actually no tables set up for ten - so we kept moving the tables and chairs from the back balcony, which are really light so easy to do. Solar lit lanterns added to the atmosphere. A nice detail: lots of multiple plug adapters, several with UK inputs, so no problem bringing UK electricals. Fixtures and fittings largely as described. Having stayed in some other similar priced and advertised places I'd say this was more 'homey' rather than modern, sleek and swish. We liked that. The surrounding area is great - something for everyone within an easy drive. Walking into the centre of Ceret will take 35 minutes. We drove in a couple times and managed to park in the centre - not easily in August, but we managed. Our niggles: The house does actually get quite warm in mid summer, and there are currently only three fans for five bedrooms and the main room. The mosquitos are hungry so leaving bedroom windows open feels risky - only one room has a mosquito screen. It would be easy to solve this. We're not the first people to mention it, so hopefully the owners will provide a fan for each room (and/or fly screens throughout). The mattresses in the twin room on the main floor are rather worn, with uncomfortable springs that we heard and felt every time we moved, and I'm a slim, relatively light woman. Given the emphasis in the description on high end bedrooms, this was unexpected. The shower fitting in the master bedroom is (getting) quite stiff. At 83 my parents aren't particularly arthritic, but several times had to ask for help to get it on or off. The owners are clearly putting a lot of work into this property and so I expect they will easily solve these little things in which case it would be easily worth 5 stars. For elderly travellers - the only room on the ground floor has a bathroom with shower over the bath. You need to be able to manage stairs or getting into and out of a bath to have a shower. Just for info. Thank you very much for your review, Alison, and the complimentary remarks you kindly made. It is clear that we need to take action to keep the house cool and the mosquitoes away when the temperatures soar. We will do that this winter. We will also take a look at the mattresses you noted. These are relatively new and we were not aware that they have become uncomfortable. Finally, that shower controller in the master bedroom may well need attention. For an expensive fitting, it can be surprisingly difficult to use, I agree. The villa was lovely with a good sized pool. It was exceptionally clean and well presented with a range of seating and dining areas. Three of the bedrooms are accessed from an external staircase and 4 are ensuite each with lovely fluffy towels. You do have to take ypur own beach towels. The villa was very well stocked with a range of essentials which made self catering simple, particularly given the villa’s proximity to the supermarket. We were there during a heatwave and felt the villa would benefit from air-conditioning or ceiling fans. The fans within the main house struggled to impact on the heat both within the bedrooms and the main living area. The housekeeper was very welcoming and exceptionally helpful. There was wonderful access to the river directly from the house which was lovely and cool during the heatwave. The walk to Ceret takes approximately 25-30 mins along a cycle route/pathway. Ceret hes a number of restaurants and cafe/bars, be aware you really need to book if you plan to go out for an evening meal. Thank you very much for your review, Dawn, which I saw today for the first time. Since it is the first three star rating we have ever had, you can be sure that you have our full attention. It is clear that, after this year's heatwave and one very hot week last year, we cannot consider high temperatures exceptional. We will be making changes next year to ensure that our guests remain as comfortable as possible however hot it gets. The villa is very spacious and has every comfort you could want for a family holiday from the beautiful pool to the table tennis table. There is a lovely garden with many places to sit and relax in the sunshine. The nearest supermarket is two minutes walk away, very convenient. There are lovely beaches within easy reach and for cyclists the routes into the local hills are to be recommended. The owners and their local representatives were friendly, efficient and welcoming. I would definitely recommend this property. Thank you very much for your review. We are delighted that you had a good holiday. This villa has everything a family would want for a most enjoyable holiday. It is extremely well equipped in a superb location,we particularly enjoyed the wide variety of outdoor sitting and eating areas all based around a central pool area. We were a party of 9 with 3 generations ranging from 5 to 75 and all enjoyed themselves immensely. The accommodation was clean and well maintained and everything was explained on arrival by a most pleasant housekeeper. A bonus was a good supermarket within a short walk, ideal for fresh bread each morning and everything you would need for the rest of the day. A short drive to the coast although our younger members much preferred the superb pool. Thank you very much for this review. We are delighted that you enjoyed your holiday. We were a three generations family and had a wonderful week there. The area is stunning, and we made the most of it, visiting beautiful Ceret, the lovely beaches, and other attractions that are within a short-ish drive, including the Salvador Dali museum in Figueres and the fabulous aquapark. The house itself is well equipped and maintained. The swimming pool is clean and the garden beautifully looked after. The river at the back of the house, is also a great attraction. The reason why a star was lost in this review, is because we were there early July and had temperatures of over 30 deg C, and the house became uncomfortably hot. There is no air con and not enough fans. When the temperature fell to the mid to high 20s it was fine, but I understand that these high temperatures are quite frequent these days! Other than that, it is full marks! Ten of us of three generations (including four children, aged 8 to 12) spent a wonderful fortnight at this villa. The property was exactly as described, with loads of space and extremely well equipped. The booking process was very smooth and all the people who looked after the villa-the housekeeper/cleaners, gardener and pool cleaner were great. The area was excellent for the kids-with the beach at Argeles, the nearby swimming lake and a harbour-side dinner in Collioure being particular highlights. If we had a gripe, it would have had been great to have access to at least the garden of the the villa slightly earlier-the flight to Perpignan gets in VERY early- and the walk to Ceret was rather longer than advertised, at least with the kids! Thank you so much for the review. We are always delighted to hear that our guests are happy with our house, and all that it offers. We fully appreciate the difficulty of not being able to obtain access to the house until 3.30 p.m, particularly, when you have an exceptionally early landing time. It really does take our team all of the time that they have to prepare the house to the high standards we expect after the previous guests have left that morning. 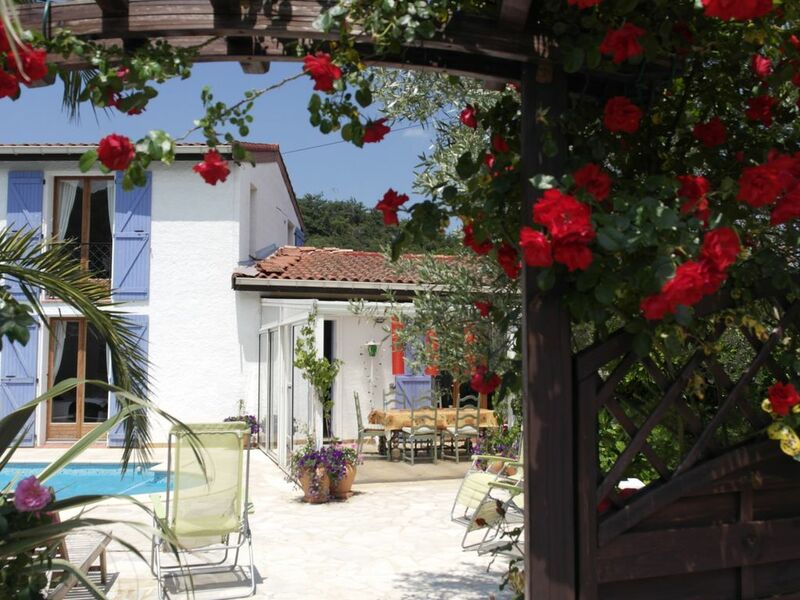 The villa is situated in a magnificent part of the world where the sun shines almost every day. The house is about 5 minutes drive from Ceret and there is a supermarket just three minutes walk from the house. These rates are fully inclusive of linen and towels ( not beach towels).